In this issue: new program models, new team members and a new podcast! Happy Fall! Common Impact is excited to head into the last few months of 2018 (can you believe it?) with new initiatives under our belt and a wealth of inspiration. Over the past eight months, we have had the opportunity to define and launch new models for scaled impact, interview everyday leaders from all backgrounds to understand how they create a meaningful impact in their communities, build our internal capacity by hiring new rock star team members and create new partnerships that enable inclusive and sustainable social progress. Interested in learning more about what is going on behind the scenes at Common Impact? 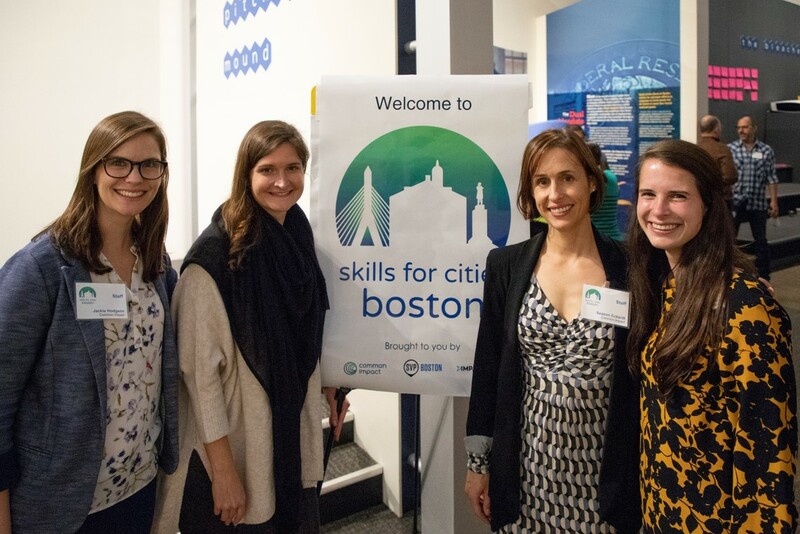 Our first Skills for Cities event took place on September 25th at The Boston Fed and engaged local leaders from the business and nonprofit sectors in a day of skilled volunteerism that delivered measurable impact for Boston and the UN Sustainable Development Goals. Hosted by our CEO Danielle Holly, Pro Bono Perspectives is the latest in a series of new Common Impact initiatives focused on showcasing the people, organizations and ideas that are shaping new models for purpose-driven work. Pro Bono Perspectives features everyday leaders working at companies and nonprofits of all shapes and sizes and shares practical advice for listeners wanting to use their own talents to create positive social impact. Join us in celebrating Pro Bono Week 2018! Engage with us on social media! Tag @CommonImpact in your #probono service posts during #PBW18 and follow our posts celebrating the volunteers, nonprofits and corporate partners that make skilled service possible! Stay tuned for new, featured content on our blog and podcast, including a special episode in recognition of Pro Bono Week! Common Impact defines skill sharing as a two-way talent exchange where both pro bono professionals and their nonprofit partners are learning from each other. The change we see is not just for the communities we support, but also for the volunteers and nonprofit leaders participating in these skills-based volunteer projects. In New York? Join us on 10/16 for Be Social Change's Nonprofit Connector, starting at 6:30pm! For a 25% discount, use the promotional code nynpc25 at checkout. In Boston? Join us on Giving Tuesday, 11/27 for Making Good Happen at Work in partnership with Harvard Pilgrim Health Care Foundation. Making Good Happen At Work is an interactive conversation on creating and tending an effective corporate service and giving program. Designed for business, human resource and corporate giving/volunteer leaders, the discussion will focus on the goals and purposes of employee service and giving programs, as well as practical strategies to start and enhance them. Check out our full newsletter to stay up to date with the latest and greatest at Common Impact!